This system allows penetration through rocky soils such as a pit run. The piles are screwed into the ground until required resistance is reached. The pile is attached to the foundation using saddles. Cracking on walls, ceilings and floors are the first signs of settlement indicating that something is wrong. Doorways are the first place where cracks occur. Doors that don’t open or close properly indicates movement. This project required the installation of 10 helical (screw) piles to stop further movement and to attemp to level this house. Cracks on the foundation walls will appear. Abalon mobilized and set up to begin the underpinning project. Heavy duty saddles are used to support the works. There are also light duty support brackets. For decks and light structures. Johnathan Rojas is holding a helical (screw) pile lead, this one has a 10 inch and a 12 inch helical on it. Holes are excavated at all pier locations. A portion of the footing is removed to allow for pier installation. Andres Rojas is directing the installation of a light duty pier that will hold up the front entrance deck and stairs. The rig has to be maneuvered with lots of expertise. After the lead section is screwed in. Additional extensions are used until required depth is reached. The rig is small and can fit through most places. Helical (screw) piles are great when the soils are rocky. The shaft of the pile is kept vertical and as close as possible to the wall. Plywood is used on the wall to protect the structure. When the pile is at the required depth, it is cut and the bracket is installed under the footing. A “T” is installed, this is a part of the jacking mechanism. The “T” is bolted on. 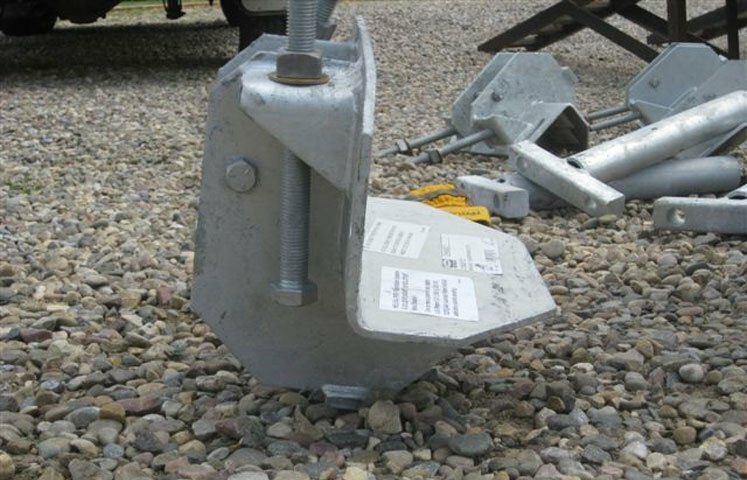 The piles can be adjusted by turning the 2 bolts. This is a light duty bracket for the deck. Once all piles are in completely with all the brackets and “T’s”, jacks are installed and all the piles are moved at the same time. They are moved a 1/8 of an inch at a time. The technicians watch for wall movement. The technicians are all lead by a site supervisor who has a builders level set up during this operation. Once piles are set, the weeping tile is reconnected, covered with washed rock and the excavation is backfilled. The project is complete. The house is now level.